A kajillion of you have asked if I know the best way to connect with plus size babes where you live. And honestly, unless you live in Tucson, I have no idea. Rachele from Rad Fat Vegan has created the solution! Fat Pals. "Connect with other fat identified folks if you feel overwhelmed by negativity or need a friend. Send and receive positive messages, artwork, encouragement, etc. 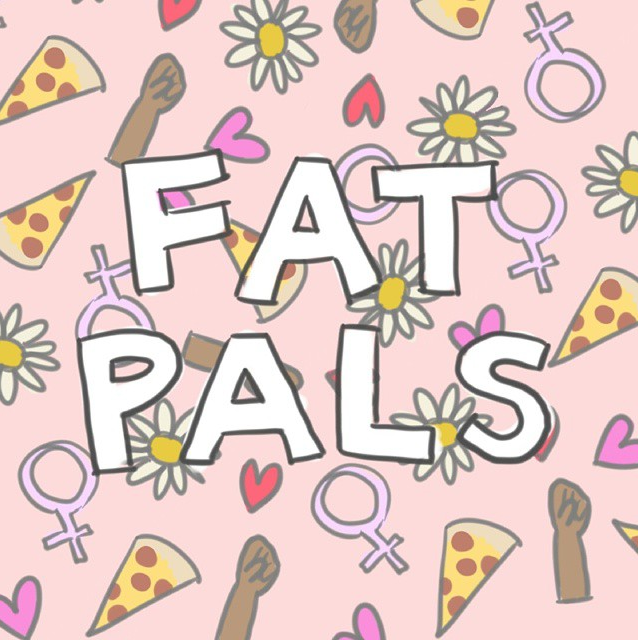 Take part in Fat Pals girl gang activities and action. Complete the below survey and Rachele will match you with a Fat Pal! You may also receive messages or mail from Rachele Cateyes. Please be safe and do not share anything that would put you in danger. Rachele will not disclose your address to your Fat Pal unless it is a PO box. PO boxes are encouraged but if you decide to share your address with your Fat Pal yourself, that is up to you. You may sign up as much as you would like, just make sure you send at least one thing to each Fat Pal you are assigned. No sexism, racism, ableism, homophobia, fatphobia, transphobia, diet talk or general hatefulness allowed. All gender identities and sizes welcome. Share your positive messages! #fatpals"
- Bomb the blogs of fat girls that need it with encouraging comments. - Attack our fat pals with letters, art and chub love. - Fight negativity with comradery. - Take our bad assery into the real world and out from behind our screens. If you'd like to sign up, here's the link! Happy pal-ing!